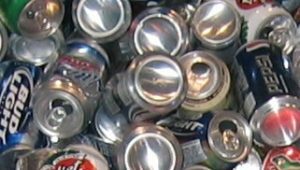 Juice cans and diet drink cans belong in the tin cans. Please rinse out all beverage cans prior to disposal. Aluminum cat food cans or other aluminum food cans (empty and rinsed of all residue) should be disposed of in the Tin Cans. The material is melted and typically used to make new beverage cans.